Apex Motor Car Co.; Apex Motor Corp. 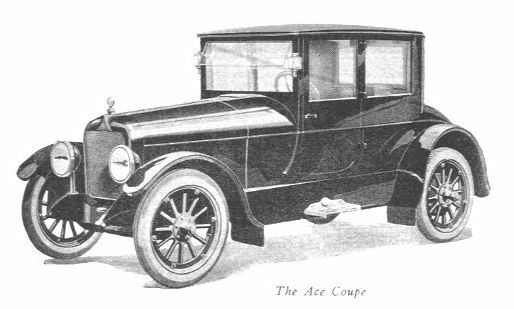 The Ace was an American-assembled car made in Ypsilanti, Michigan by the Apex Motor Car Company, which was reorganized as the Apex Motor Corporation in 1921. The initial batch of cars assembled were sent to Seattle, Washington dealer FE Earnest, who had the idea for the Ace after he was unable to secure a steady supply of new cars for his dealership. 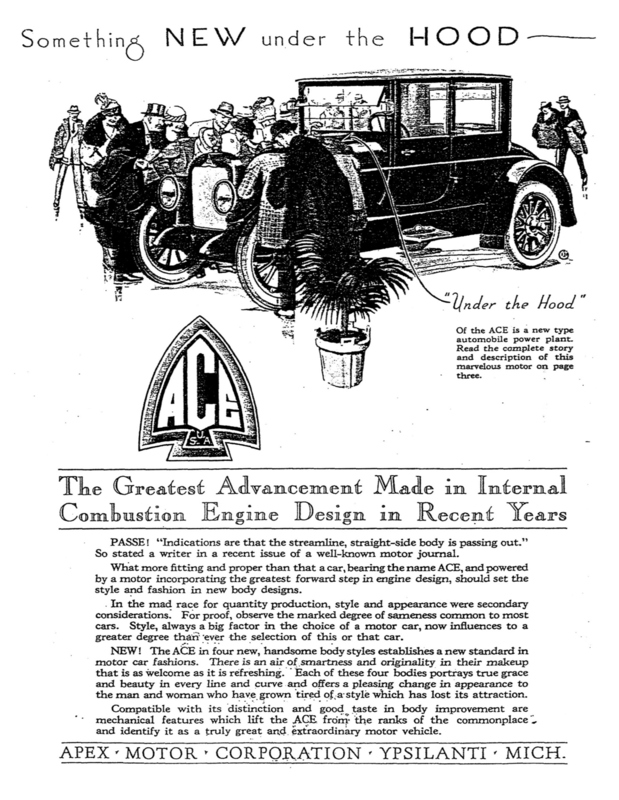 The most interesting feature of the Ace was the Guy Disc-Valve motor, created by engineer Fred M Guy, and Otto W. Heinz. Initially, it was prepared as a four cylinder engine for production in the Hackett, but the company folded before it was ready. In April, 1921, Guy and Heinz left the Apex Motor Corporation, obviously with the support of Apex, to found the Guy Disc Valve Motor Co. in Ypsilanti. 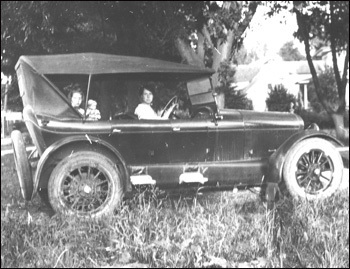 In mid-1921, a Model H tourer with a conventional Herschell-Spillmanstraight-6 was added, with a selling price $2,000. The man at the helm at Apex was by now Harry T. Hanover. For 1922, the Guy engine was gone. The Model F “Pup” was added to the range, fitted with a conventional 4-cylinder Gray-Bell engine, and priced at $1295. It was sold beside the Model L “Scout” with a smaller than previous Hershell-Spillmann straight-six engine, and the new top of the line Model C “Combat” with a 340 c.i.Continental Six engine. The sixes ranged in price from $2260 to $3150. Most Ace cars were tourings, with a few roadsters, and a 4/5 passenger “Coupe-Sedan” with a custom-built look. The “Combat” line also included an attractive speedster in the Kissel Gold Bug pattern. Apex was initially involved in the Diamond Cab project, which also included Gray Motor Corp., and Guy Disc Valve Motor Co. Within a few months, these plans became obsolete as Diamond Cab got new owners, resulting in the cab built by Elcar, and another cab built by the Driggs Ordnance & Manufacturing Corp.. 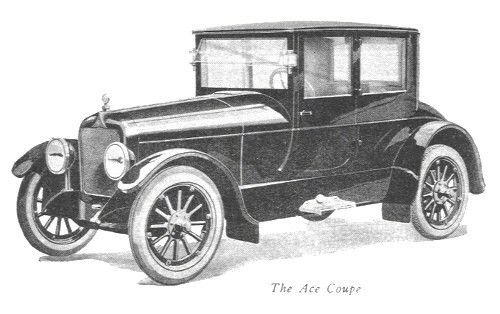 Ace automobile production ended with the 1922 model year. Total production was 256 cars. Apex Corp. was sold to the American Motor Truck Company in Newark, Ohio, in 1922. For a short time, Apex built bus bodies here, but soon closed forever. The 1921 Model L and 1922 35-70 are mentioned by a single source. While the L appears a smaller companion to the Model H, the 35-70 possibly was nothing more than a renamed 1920 Model H Coupe-Sedan. There is no existing Ace automobile known, however the Ypsilanti Automotive Heritage Museum offered a $5000 reward for evidence that directs to such a car. Although the museum continues to search for a surviving Ace, the reward expired in 2003 with the death of museum co-founder Skip Ungrodt. ^ Jump up to:a b c Georgano, Nick (2000). The Beaulieu Encyclopedia of the Automobile. London: Stationery Office. p. 1792. ISBN 0117023191. ^ Jump up to:a b c Kimes, Beverly Rae (1996). The Standard Catalog of American Cars: 1805-1942. Iola, IA: Krause Publications. p. 1612. ISBN 0873414284. Jump up^ Kimes, Beverly Rae (1996). The Standard Catalog of American Cars: 1805-1942. Iola, IA: Krause Publications. p. 666. ISBN 0873414284. Jump up^ coachbuilt.com: Driggs Ordnance & Manufacturing Corp.
Jump up^ Kimes, Beverly Rae (1996). The Standard Catalog of American Cars: 1805-1942. Iola, IA: Krause Publications. p. 14. ISBN 0873414284.